Stay active with our youth and adult athletic leagues. Dive into Clarksvilleâ&#x20AC;&#x2122;s history by taking a tour or participating in an event at Fort Defiance. Explore over thirty activities including fitness, martial arts, dance and enrichment. AQUATICS Learn about our indoor pool and the classes and programs it offers. GOLF Get a sneak peek of the new additions to Swan Lake Golf Course. Get aquainted with the locations of our parks, trails, pools and recreation centers. SPECIAL EVENTS Looking for something to do in Clarksville? We host a variety of events for you and your family. Check out a sneak peek of our summer camp offerings. RENTALS From event centers to pavilions we have the perfect place for you to host your next event. CALENDAR OF EVENTS Never miss a beat and explore our upcoming events all on one page. This past fall I had the opportunity to take my mother on a trip to the Grand Tetons, Yellowstone and Glacier National Parks. We saw incredible scenery that is native only to those areas of the world such as geysers, glaciers, mountains and animals galore. We were simply in awe at the sheer size and “wildness” of it all. It was a trip that I will cherish forever, but after a week I was ready to get back home. Back where the people are more plentiful than wildlife, it never snows eight feet deep and I’m in no danger of getting eaten by a grizzly bear. Clarksville is, and always has been, my home. For those who prefer somewhere else, I would invite you to get to know the place I know. A place where it’s not Christmas until you’ve taken the family to see the lights at the RiverWalk. Where the Clarksville Downtown Market isn’t just a place to get fresh food grown by your neighbors, it’s a place to catch up with friends and take out of town guests. It’s where groups line up to race a handmade cardboard boat down the Cumberland just for bragging rights. I’m proud to call Clarksville my home and I am proud to be a part of what makes it home for others. ONLINE REGISTRATION Registering for our programs is FREE and EASY using our online registration option. Simply log-in using your email address at CityofClarksville.com/ParksRec. New to Parks & Recreation? Create your family’s household account online and get started today! Registration is also available in-person at the Clarksville Parks & Recreation office, our recreation centers, and pools. GET CONNECTED Main Office (931) 645-7476 102 Public Square Clarksville, TN 37040 CityofClarksville.com/ParksRec /ClarksvilleParksandRec /Clarksville_PR /ClarksvilleParksRecreation For ADA Assistance call (931) 645-7476. LOOKING FOR SOME OFF-LEASH FUN? NEW! 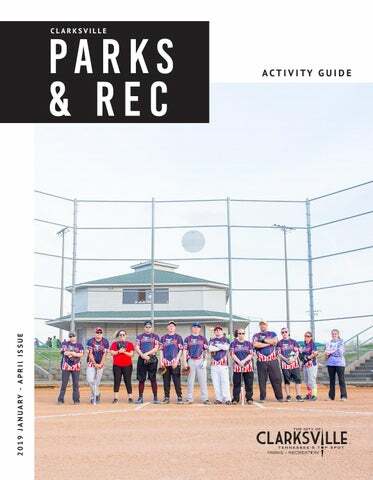 TRAIL EXPANSION Visit page 21 to read more about the newest section of trail and the addition of outdoor fitness equipment at McGregor Park! @therealgabrielprivett Load your tail-wagging friends into the car and take them out for a day at the dog park! Visit King’s Run Bark Park inside of Liberty Park located at 1188 Cumberland Drive or Heritage Park Bark Park located at 1241 Peacher’s Mill Road. START SMART SOCCER This developmentally appropriate introductory program prepares children for organized soccer in a fun and safe environment without the threat of competition or the fear of getting hurt. Pre-registration is required. * $100 registration cost plus final costs, which will be determined based on number of teams registered. NEW! INDIVIDUAL REGISTRATION 45+ Men’s League & Women’s League will be accepting individual registration this year! Clarksville Parks and Recreation offers a variety of softball leagues to provide adults the opportunity to play competitively. Round up your friends and sign up! League registration costs are per team. However, individual registration is also available for 45+ Men’s League and Thursday Women’s League. All games are held at Heritage Park Softball Complex. Practices begin the week of March 1 and are available on a first-come-first-served basis. Final fees will be calculated when all teams have registered and are due March 8. Season play begins the week of March 17 (Women’s League begins June 6). Clarksville is home to three recreation centers that provide residents with fun experiences at an affordable price! Each center features a full-size gymnasium, fitness center with cardiovascular and strength training equipment, game room and a meeting space that is available for private rental. The centers are also home to a variety of special events, athletic and enrichment programs and after-school activities. Hours vary by location and can be found online at CityofClarksville.com/ParksRec. HOMESCHOOL P.E. Homeschool students and their families can enjoy this fun 50-minute drop-in class that counts toward their physical education curriculum credits. VALENTINE’s DAY PARTY Friday, February 8, 5-8PM Location: Burt-Cobb Recreation Center Fee: $3 per person Dance the night away while enjoying fun activities such as face painting, arts and crafts and refreshments. Open to ages 6-12. This drop-in program held in the gymnasium provides a variety of indoor recreational activities, music, games and unstructured playtime for parents and their toddlers. Toddlers will have the opportunity to improve their gross motor skills, make friendships and create memories. Parents must provide active supervision. Saturday, February 16, 10AM-2PM Location: Kleeman Recreation Center Fee: Free This program will celebrate all elements of black history through music, monologues, motivational speeches, and dramatization. Saturday, April 6, 10AM (ages 3-5) & 11:15AM (ages 6-7) Location: Crow Recreation Center Fee: $3 per person A series of clues will lead you around outside the recreation center looking for hidden eggs. In addition to the scavenger hunt, there will be a photo opportunity with the Easter Bunny! Thursday, April 18, 5:30-7:30PM Location: Burt-Cobb Recreation Center Fee: $3 per person Bring the whole family for a low-cost, fun-filled evening of competitions and games. Compete in races (3-legged race, spoon race, scooter race), rotate through game booths (bucket toss, arts & crafts, bean-bag toss) and visit a variety of stations (face painting, popcorn, snow cones). A separate toddler area will be provided. Refreshments will also be served. Pre-registration is required. Saturday, March 16, 8AM-1PM Location: Burt-Cobb Recreation Center Fee: Free Shop from over 30 vendors selling both new and used items including jewelry, home goods, crafts, clothing and toys at our indoor flea market. Vendor space is available for $20. Contact Burt-Cobb Recreation Center at (931) 472-3381 for more information. NEW! THE BENEFITS OF COmPOSTING Saturday, March 16, 10AM-12PM Location: Crow Recreation Center Fee: $3 per person Compost is a crumbly, nutrient rich soil amendment that is great for your plants, lawns and gardens. Best of all, compost is cheap! NEW! OPERATION MARCH MADNESS Saturday, March 23, 10AM-3PM Location: Crow Recreation Center Fee: $60 per team / $20 per person Participate in a 3-on-3 basketball tournament in honor of the NCAA March Madness Playoffs. Teams will compete for bragging rights, gift card and a tournament trophy. BASICS OF CAKE DECORATING Saturday, April 27, 10AM-1PM Location: Kleeman Recreation Center Fee: $30 per person Learn how to beautifully decorate cakes with basic buttercream techniques through repetition and practice. Participants, ages 16 and up, will receive three hours of instruction along with a take-home cake decorating kit. Pre-registration is required. NEW! GARDENING IN SMALL SPACES Saturday, April 27, 10AM-12PM Location: Crow Recreation Center Fee: $3 per person UT-TSU Montgomery County Extension agent, Karla Keen will discuss how to garden with limited room to grow. Pre-registration is required. RENT A FACILITY Interested in hosting a private event at a Clarksville Parks and Recreation facility? The arrows to the left indicate our pavilions and facilities available for rent. For more information or to purchase your permit, visit CityofClarksville.com/Rentals. New Providence Pool is covered to allow for year-round swimming now through early May. Clarksville offers four outdoor pools during the summer, May 25-August 4. For hours of operation, visit CityofClarksville.com/ParksRec. POOL PARTIES Clarksville Parks and Recreation is excited to offer pool party packages during public swim times! Party packages cost $10 per person up to 24 people, minimum of 10 people. All party packages include two hours of water play equipment access, pizza, juice box, and ice cream cup per person. Book online at CityofClarksville.com/ParksRec. Get fit the way you want with this drop-in fitness program designed to improve agility, balance, coordination and strength that helps participants maintain an independent lifestyle. TODDLER SPLASH Children can enjoy water games and seasonal crafts while getting acquainted with the water or practice previously learned water safety skills. Pre-registration is not required. NEW! WATER PLAY DAYS Clarksville Parks & Recreation is excited to introduce new water play equipment to the pool. Each weekday a different water play feature will be available to play on. Stay tuned to Clarksville Parks & Recreation’s Facebook for the water play schedule. BUBBLEMAKERS SCUBA Youngsters can join in the family fun of scuba diving or even start a trend! Experience what scuba diving is like under the direct care and supervision of Professional Association of Diving Instructors (PADI). Children should be comfortable in the water. Gear and equipment will be provided. The first hour of swim will take place at Waterdogs Scuba then New Providence Pool. Co-sponsored by Waterdogs Scuba. Pre-registration is required. HOURS & AMENITIES Fort Defiance is open daily Tuesday - Saturday, 10AM-4PM and Sunday, 1-4PM. Amenities include a gift shop, picnic tables, a walking trail and exhibits. Admission is free. TAKE A TOUR School field trips and group tours are available! Tours last approximately two hours and can include lunch on the grounds. For more information, call (931) 472-3351. HISTORICAL EVENTS THE SURRENDER OF CLARKSVILLE Saturday, February 23, 10AM-3PM Join us for a living history event to commemorate the surrender of Fort Defiance to Union soldiers in 1862. Uniformed soldiers will provide living history and cannon firing demonstrations. Visitors are welcome to tour the permanent exhibit and view the award-winning film, â&#x20AC;&#x153;Crossroads of Change.â&#x20AC;? NEW! HISTORY FOR KIDS Saturday, March 16, 1-3PM Sign up for an afternoon that is both fun and educational for only $5! Have you ever wondered what games children played in the past or with what toys they played? Children, ages 7-12, are welcome to explore our toy box and also our trunk of dress up clothes. Be a Civil War soldier and learn how to drill and march, or learn how to have a proper 19th century tea party. Also, learn how to dig up artifacts from the past with an experienced relic hunter. Pre-registration is required. INDIAN ARTIFACT SHOW Saturday, April 13, 10AM-3PM Local artifact collectors will display their collections at this free event. Come learn more about those items lurking in your closet or collecting dust on your display shelves. Bring them to the Fort to find out more about your treasures! For educational purposes only, no sales. Located on a bluff 200 feet above the confluence of the Red and Cumberland Rivers, the Fort Defiance site has been a hub of activity for more than two centuries. The facility provides a variety of free events and programs offering something for visitors of all ages. SPECIAL EVENTS Special events and activities throughout the year are coordinated to provide fitness and leisure activities to the Clarksville community. Follow Clarksville Parks and Recreation on Facebook and subscribe to our event calendar to stay up-to-date! NEW! REDUCe, REUSE & RECYCLE BOAT RACE Saturday, February 23, 9AM-12PM Location: New Providence Pool Fee: $5 Individual, $20 Team of 5 Build a boat of recycled materials and race it to the finish line in one of the following categories: Man Powered or Machine/Motor Powered. Preregistration is required. NEW! LIBERTY PARK SPRING BREAK CAMP CLARKSVILLE DOWNTOWN MARKET VENDOR APPLICATIONS AVAILABLE Tuesday, January 22 - Friday, March 15 Location: Public Square Fee: $225 full-time, $175 part-time, $25 fill-in $700 food truck, $45 fill-in food truck Interested vendors and food trucks are encouraged to apply online at ClarksvilleDowntownMarket.com. All items must be handmade, homegrown or gathered by the seller or family members. This weekly open-air market takes place in the City Hall parking lot Saturdays from 8AM-1PM, May 25 - October 12. It features local farmers and artisans who offer locally grown fresh produce, food items, and handcrafted products. Enjoy live music and experience special events on select market days. March 25 - 29, 8AM-3PM Location: Liberty Park, Wilma Rudolph Event Center Fee: $75 per person Spring into action with Clarksville Parks and Recreationâ&#x20AC;&#x2122;s newest Spring Break Camp! The week will include a variety of games, sports, crafts, and snacks for children ages 9-12. Pre-registration is required. SPRING BREAK TUMBLING DAY CAMP March 25 - 28, 9-11:30AM Location: American Twisters Tumbling Fee: $40 per child While school is out, have some fun! Boys and girls, ages 6-16, can roll, flip, and turn their way through spring break. Co-sponsored by American Twisters Tumbling. Pre-registration is required. CHOCOLATE AFFAIR Saturday, February 2, 2-4PM Saturday, February 2, 6-8PM Location: Wilma Rudolph Event Center Fee: $15 per person The event will feature sweet and savory treats from local businesses. Two event times are available for all ages. Familyfriendly entertainers and activities will fill the 2-4PM event, while an adult soiree with dancing and a cash bar (wine & beer) will round out the evening event from 6-8PM. Tickets can be purchased online at CityofClarksville.com/Chocolate or in person at Clarksville Parks & Recreation, located at 102 Public Square. NEW! CLARKSVILLE FILM FESTIVAL Friday, February 15, 6-7PM (Freedom Point) - Participant Meeting Friday, February 15, 7PM-Sunday, February 17, 11PM - Filming Saturday, March 9, 5-7PM (Roxy Regional Theatre) - Public Screening Can you make an awesome film using an iPhone? Do you animate or use stop motion? We are looking for all types of film creators, beginners to experienced. All teams will have 52 hours to create a 4-7 minute film. Once submitted, your work will be judged by a panel of experts in the film industry, then shown on the big screen at the Roxy Regional Theatre. Cash prizes will be awarded. FATHER-DAUGHTER DATE NIGHT Saturday, April 6, 5:30-8:30PM Location: Wilma Rudolph Event Center Fees: $25 per couple, $10 each additional child A perfect place for fathers, uncles, grandfathers, and positive male rolemodels of all kinds to enjoy an evening with their special girl. Games, food, and giveaways will make this a night to remember. This event is open to girls 5-17 years-old and accompanying adult. Pre-registration is required. No tickets will be sold at the door. NEW! HOMESCHOOL SWIM DAY Friday, April 12, 10AM-12PM Location: New Providence Pool Fee: $5 per person This program is designed to help children fulfill their homeschool physical education requirements, learn new water skills, and meet new friends. Fee includes access to water play equipment. NEW! HOW TO MAKE A SEED BOMB Saturday, April 13, 10AM-12PM Location: Billy Dunlop Park Fee: $10 per person The city forester will teach participants of all ages how to make seed bombs. They will be made from clay, manure, and wildflower seeds native to Tennessee. Seed bombs can be thrown into the dirt to grow flowers. All materials will be provided. Pre-registration is required. ADAPTIVE SWIM DAY Friday, April 19, 10AM-12PM Location: New Providence Pool Fee: $2 per person This is a drop-in program for children and adults of all ages with special needs to come out to the pool to socialize with others and play in the water. Swimmers will have access to our water play equipment. Refreshments will be served. DAY IN THE PARK Saturday, April 27, 12-3PM Location: Liberty Park Fee: Free Learn about the wide variety of activities happening this spring and summer from the Clarksville Parks and Recreation staff. There will be giveaways, games, BCycle activities and food trucks. NEW! WETLANDS WALK Saturday, May 4 & 18, 10-11AM Location: Liberty Park Pond Fee: Free Take a guided tour with our city forester through the paved and wooden walkways at Liberty Park to learn the effects of invasive species on the habitat. Participants will get a close up view of the abundant plant and animal life that thrives in the wetlands. Pre-registration is required. WATER SAFETY DAY Saturday, May 4, 1-4PM Location: New Providence Pool Fee: Free Swimming is the most popular summer activity. Ensure your family knows the importance of water safety at our 2nd annual Water Safety Day. Stations include: Look Before you Leap, Proper Use of a Life jacket, Throwing Assist, Identifying a Lifeguard and Fun in the Sun. QUEEN CITY ROAD RACE Saturday, May 4, 8AM Location: Austin Peay State University Fee: $20 (5K) before April 12, $5 (1mi) | $25 (5K) after April 12 For 40 years this event has been a Clarksville tradition promoting fitness and fun for all ages. The 5K route takes runners throughout the streets of historic downtown Clarksville while the one-mile route takes participants on an exciting tour of a portion of APSUâ&#x20AC;&#x2122;s campus. Online registration is available beginning February 11 at CityofClarksville.com/QCRR. 50 PLUS GAMES Monday, May 13 - 18, times vary Location: Various locations Fees: $25 per participant before April 19, $30 after April 19 This event encourages participants to maintain an active lifestyle and continue participation in sports and recreational activities through friendly competitions. Participants will face off for bragging rights, as well as medals in over 20 events including table tennis, badminton, and track and field. No experience is necessary! Pre-registration is required and begins February 1. Saturday, April 13, 11AM (1 yr olds), 11:30AM (2 yr olds), 12PM (3 yr olds), 12:30PM (4 yr olds), 1PM (5-7 yr olds), 2PM (8-11 yr olds), 2:30-4:30PM (recreational swim for participants) Location: New Providence Pool Fee: $5 per person Hop into the pool for our not-so-typical egg hunt! Search for colored eggs floating or sunk to the bottom of the pools and exchange them for prizes at different stations. Donâ&#x20AC;&#x2122;t forget to take a photo with the Easter Bunny! For event accommodations & other ADA assistance please call (931) 645-7476. Pre-registration is required. We want to follow your Parks & Rec adventures every step of the way! Be sure to tag your photos using #ClarksvilleParksRec for a chance to be featured. You never know where your image will be displayed! NEW TRAIL EXpANSION A new one-third mile section of the Clarksville Greenway Pollard Road Trailhead and continues to the rail bridge abutment beside the Red River. In addition, construction will begin soon on a new section of the Red River Trail that includes additional scenic walking areas and a canoe and kayak access behind businesses on Kraft Street. This section of trail also will end at the rail bridge abutment on the south side of the Red River. A grant request also has been made for construction of a new pedestrian bridge crossing the Red River to connect these two trails. This bridge will be significant from both a recreation and transportation standpoint. Once built, a pedestrian or bicyclist will be able to start at the Tiny Town Road and Peachers Mill Road intersection in Northeast Clarksville and travel all the way to downtown without using roadways. Visit the map on page 13 to locate the new expansion. GOLF SWAN LAKE GOLF COURSE | 581 DUNBAR CAVE ROAD MASON RUDOLPH GOLF COURSE | 1514 GOLF CLUB LANE The City of Clarksville offers an unforgettable experience at two distinct city courses for players of every level. Our courses feature a variety of amenities to accommodate all playersâ&#x20AC;&#x2122; needs including twilight hour fees, discounts, memberships and more! Visit CityofClarksville.com/Golf for more information. Swan Lake Golf Course has a fleet of sixty new golf carts ready for your next golf adventure equipped with the latest technology. Be sure to take one for a swing! Bring your golf game indoors by trying our NEW golf simulator. Take a swing, score some points, share a laugh, or just throw an epic party at the Swan Lake Clubhouse! PAVILION PERMITS We have 21 pavilions located throughout the Cityâ&#x20AC;&#x2122;s parks. Park pavilions are offered in a variety of sizes to accommodate small and large groups. They are available on a first come, first served basis at no charge or can be rented in 4-hour blocks seven days a week. RECREATION CENTER MEETING ROOMS We have three recreation centers, Burt-Cobb, Crow and Kleeman, located in Clarksville with meeting rooms that can be reserved during operating hours for your party needs. MCGREGOR PARK RENTALS BOOK NOW! 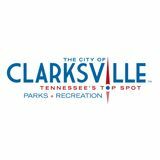 Visit CityofClarksville.com/ParksRec. McGregor Park is located adjacent to the Cumberland River. Rental options include the entire park, museum, Amphitheater stage and Riverbend stage. Clarksville Parks and Recreation has ideal settings for your next special celebration, meeting or event. We rent meeting rooms, park pavilions, swimming pools and many other facilities. CLARKSVILLE PARKS AND RECREATION OFFERS TONS OF FUN ACTIVITIES! Be sure to mark your calendars so you don’t miss these important dates. For more details or to register, visit CityofClarksville.com/ParksRec or call (931) 645-7476.